There's more than I thought would be in here that are personal recollections from throughout Martin's life, and I'm not entirely sure how I feel about it. While I haven't formulated any arguments against what Martin talks about, and I ultimately agree that deception to some degree is healthy in relationships (even if it is simply withholding certain aspects of the truth that don't need to be known and have no bearing), there's just something about this entire book that made me want to put it down the entire time. Finally! I watched half of this on the plane - I forget where to - and couldn't finish it because I wasn't feeling well, so when we finally got this on DVD at my local library, I grabbed it right away. I wasn't exactly expecting it to go there and it's kind of really sad and touching, the intertwining of the lives of man and sheep, the ties that bring people together. We never find out what exactly the source of disagreement was between Kiddi & Gummi, but the journey their brotherhood takes on when presented with a common goal is quite touching. I don't usually read graphic novels in print, but this was so good! I loved it and devoured it through my breaks within 2 days, I think? I also love the fact that Wang used pattern blocks on each of the chapter pages. Started off well, but the characters became caricatures towards the end (despite what was supposed to function as their fleshing out). Well worth the hype, and lived up to every expectation & then some! The only quibble I have is that when Uncle Aaron was shot, there was nothing to indicate where he got shot - including a noticeable lack of blood or even Uncle Aaron grabbing the shot wound area - though I get that it's a family movie. And I think they did an amazing job catering to basically everyone from children to adults! I devoured this novel in a day - it's darkly comic, it kind of takes you by surprise, but also explores how a deeply dysfunctional family relies on its blood ties even as those ties continue to bind them each to their arguably unhealthy positions in their lives. I put off watching this for the longest time and I have no idea why, because it was very thought provoking and unafraid to voice questions about how to solve social issues to do with race and class given that they already exist and are so embedded into society (in this case in Brazil). All in all, pretty brutal, but also I imagine quite necessary. Got this from Dewey Divas... last year. So by now the actual book has been published, and I hope no major changes have been made because I'm basing my comments off the ARC. I've read Rovelli's Seven Brief Lessons on Physics and this book on time approaches the readability of that one. Rovelli has a knack for making difficult-to-understand concepts approachable for the lay person coming to the book without prior knowledge of physics, and this can be seen in both Seven Brief Lessons as well as here in The Order of Time, but then something happens halfway through this book that takes a turn as far as writing is concerned: we take a step way away from physics and into our personal experience of time, and cultural references to time are used to supplement the text - I would appreciate all of this a bit more, I think, had the book been a more in-depth exploration of time rather than the pithy journey it is. And oddly, there are two chapters (one and a half, I guess?) that are incredibly dense that come between the physics part and the sociocultural part, that even Rovelli says you can skip if you find too much (or something to that extent). I wanted so much to love the entirety of it, but because of the weird transitions (at least in the ARC - perhaps this has been fixed in the published edition) and almost overly poetic third part, I'm having a hard time doing so. I will be re-reading the first two parts to gain a better understanding of the concepts Rovelli touches upon, as there were several points I wasn't entirely sure I understood, but I'll be skipping the last chapter or two. Could've been better. A bit too sensational in tone, or not delving deep enough? I suppose that should be expected from a popular science book, but I still feel like it could've done a much more thorough job. As it is, my appetite for learning about parasites has been whetted, so I would like to give credit where it's due and say that Simon did a good job of making the subject interesting, but to me personally, the topic of parasites is already interesting, so I feel like he could definitely have gotten a bit more technical and detailed without fear of losing the audience (or at least me). Did I... miss a chapter or maybe an entire section? I feel like this ended way too early without giving me enough. I also feel like I should like it because the general sentiment whenever deGrasse Tyson is brought up is that he's amazing, but I'm not amazed and I don't know if that's on me or not - I feel like I should have enjoyed this entire book more than I did overall, is what I meant to say. A couple of the plot points/twists were pretty predictable, or at least the possibility of them hovered over my head throughout, but I don't think that detracted much from the movie at all. I do agree with what one of my friends said about the text at the beginning about the underground tunnel network being slightly unnecessary since it primes you to think about what that would mean for the tethered. A couple of the trailers before the movie looked really good too, including Pet Sematery and Ma (terrifying). So glad I caught it before it finished this run! There were a number of picture books as well, but I don't remember them all. When did they make a movie of me & my entire life, and how did I not know about this until now? Karen Cries On the Bus (2011). Loved it. It's kind of like how I wished Eat Pray Love ended when I watched it the first time (and the second time). Also a bunch of picture books, but I'll be skipping those in this list. Soooo... I feel like this was a lot longer than it needed to be, one. Two: I'm not sure why the movie had to be cut into two parts (the love story/before and the after) - I wish the director would've just picked one and stuck with it. It did remind me of another movie I watched a little while back, Son of Sofia, but really just in terms of the boys becoming literal animals. I have a confession to make: I've never actually read Macbeth. That being said, after a really really quick glance through Wikipedia's plot summary, I don't know that Lady Macbeth, who felt guilt for her crimes, descended into madness as a result & in the end took her own life, is a good reference point for Katherine, although I understand why the reference was made in that she & Sebastian (but mostly her, fueling the delusion and really taking the reins, almost dragging him along for the ride) had to kill and kill and kill again in an attempt to get the outcome they were hoping for. There were constantly things she had overlooked, whether it was that the husband would find out or that he had an illegitimate child he made master of the house in the event of his death. Although Katherine is definitely guilty for all her crimes, there's a part of me that also wants to shout out: but if it wasn't for the oppressive patriarchal situation she was thrust into (e.g. bought, along with a piece of land, as a bride for a husband she neither loves nor respects and who also won't touch her; then blamed for not fulfilling her wifely duties (i.e. bearing an heir) despite the fact that the husband is making that impossible, as she levels against him to the father-in-law when he accuses her of failing to fulfill her duties and bringing shame upon the household). Makes me think of how Sun Tzu cautioned to never hem in your adversary (always let an outlet free), for you never know what someone who has nothing left to lose can muster their strength to do. This one's an article, but Is Sunscreen the New Margarine? I'm assuming because frequent sun exposure had generated health benefits for them that bolstered their systems even as they developed melanoma. "Over the 20 years of the study, sun avoiders were twice as likely to die as sun worshippers. There are not many daily lifestyle choices that double your risk of dying." Apparently it's just as bad as smoking (though it's not noted how many cigarettes a day). Twice as likely. Twice! I'm interested to know whether there was a difference between what these two groups died of though, whether sun avoiders tended to die of health issues that sun worshippers didn't, or whether it was a different class of thing killing them altogether. "And the current U.S. sun-exposure guidelines were written for the whitest people on earth." Oooooh! Race factors into the promotion of sunscreen usage, too! (Surprise, surprise.) Of course people with different types of skin process sunlight differently. And of course broad guidelines that don't take that into consideration are used officially. Another TED book, Lightman argues that it is to our advantage to take at least half an hour of each day to "waste time" and do nothing (productive). In a culture that is so driven by productivity, and where idleness is seen as sinful or - as much of society has also moved away from the religious - a bad character trait (i.e. "think of all that you could do during that time! "), this seems counterintuitive to living a good life. That being said, I feel like it's catching on that we need to focus less on productivity at the cost of our own well-being, both in terms of physical & mental health, and instead focus on self-care, whether that be through meditation, walks in nature, or other such activities that don't, strictly speaking, produce anything in and of themselves. However, these instances spent "wasting" time are actually to our benefit, even if we think in terms of productivity, for it is when we are well-rested and have given our minds room to roam and think outside the box that we are able to arrive at insights previously unreachable just by thinking about and working at a problem during all your waking hours. I enjoyed this one, and I think it goes well with Beyond Measure in complementing what Heffernan says in her book (and I'm assuming talk) as well. This was... very slow. I feel like it must have been a commentary on class & gender within Argentina, but I also don't know anything about the cultural context in which it's placed, so it's difficult for me to say much about it. I thought that Vero would be haunted more literally by the ghost of a headless woman, but it only came to me towards the end that it is she herself that is the headless woman in the film, in that she allows the men in her life to overwrite what she knows to be true (i.e. that she ran someone over, and it is the boy that was later found in the canal). First off, I love Lim's illustrations, and I remember they did the illustrations for The Spirit of the Sea as well. I love that Lim works with writers who are immersed in Inuit culture for stories that portray and reflect Inuit life and legend! This was very wordy for a picture book, personally, and would probably serve better for slightly older kids (i.e. not for a read aloud storytime program), but I love that the children are multidimensional, experiencing jealousy and complicated emotions throughout the story. It's the first time any of the simmering disagreements were dealt with on such a grand scale - there were times when Celine & Jesse's ideologies clashed in the previous two movies, and sometimes I'd see just how American Jesse's character is (in all three movies), but I actually really enjoyed watching them fight like an actual couple, with lowballs and emotional appeals and the "always" and the "never"s, because it means that Linklater allowed these two to develop through those 10 years that weren't caught on film. While the first two kind of told a magical fairytale story of True Love (even in some of its complexities), I feel like we need to see Before Midnight to really get the picture of what forms that love can take, and how it might look even when it doesn't resemble at all what is produced for mass consumption. This was so cute & wholesome and made me want to cry during two or three scenes. Amazing. I'm really looking forward to watching Paddington 2! The ending had me wondering whether that forgiveness actually happened, and almost wrapped up too neatly, though it was still ambiguous enough that readers could understand that even if Wanda had forgiven Peggy & Maddie, Maddie had learned a valuable lesson about how to treat people from then on. The sequel did not disappoint!! I LOVE IT. And I loved Hugh Grant in this - he was kind of channeling Jeff Goldblum vibes, imo, and killing it. I love that Fleming's introduction is so thorough as she goes through the terms she uses throughout the book as well as debunks myths about white supremacy in succinct sections. On any excuses made for the founders of the U.S. (i.e. for those who say "gotta see both sides...") & note that it's unfair to judge the actions of the founding fathers by the standards we hold today: "But this narrative - long dominant (and typically invoked by white men) - deliberately ignores the fact that people spoke out against and opposed white supremacist genocide and chattel slavery while these things were happening... The histories of indigenous resistance against European aggression, slave rebellions, and abolitionism clearly demonstrate that there were people who knew it was wrong to treat other human beings as if they were disposable" (p.47). Fleming also makes mention that there were European white people who also stood up against slavery, all in all making a very clear point that these actions cannot be said to have been excusable just for being a product of their times because the immorality of oppressing groups that weren't European white men was clear even at the time. In "Listen to Black Women", Fleming talks about how black men & women are equally likely to be racially profiled, harassed, and arrested by police in NYC - yet the only images & discussions to be had focus almost entirely on black men. Racism works together with sexism so that feminist movements are not immune to racism: "Whatever the white women's movement of the 1960s and '70s was, it was not a movement to confront or dismantle racism" (p.67). Likewise, black men are not magically free of sexism. Nor are black cisgender feminists necessarily trans friendly. I vaguely knew about Paris being considered African American-friendly, but this is the first I've heard of the "African American Privilege... In the French case, [it] means benefitting from friendly relations, access, and resources denied to French people of color. Though it's easy to get caught up in the rapture of being treated like a human being... the sad reality is that African Americans are typically used by the French to minimize or outright deny their own racism" (p.82-83). It does remind me of something else Fleming talks about in maybe another chapter or this one, where she relays a study where white people who had interacted with a black friend (or... I believe in this case, voted for Obama) acted in more racist ways after the interaction, as though they felt justified in doing so (because look! They have black friends! They voted for Obama! They can't be racist!). This is scary because it's true: "Trump is not some kind of alien creature... his brand of crude white supremacy resonates with tens of millions of US citizens (as well as white nationalists and neo-Nazis across the globe) because his views align with many of the foundational principles upon which Western colonial expansion broadly, and the United States specifically, were established. And the issue here is not just that our nation's founding principles were explicitly white supremacist, xenophobic, and imperialist. It's that these principles have been actively maintained, institutionalized, and normalized for generations" (p.114). The racist state of society as they stand right now strikes people as the status quo, just the way things are, and it's this very notion that needs to be fought against. There's a lot more that I didn't mark down because, as I said, I ran out of bookdarts, but this was definitely an informative read! I loved it, and would recommend it to anyone interested in the topic of racism. This paired so well with How to Be Less Stupid About Race, though these essays were so much more personal. One of them, Dying to be Competent, was absolutely heartbreaking. I'm not writing much about Thick only because I couldn't take notes as I was reading it. Collection of short stories. They were almost a hit for me, but I can't really say what was missing from them that made them a miss. I loved it, from the buildup of tension (I thought for sure the slaughterhouse scene was going to take a different turn - why would you agree to talk about something with someone you know doesn't mean well to you, AT A SLAUGHTERHOUSE???) to the ambiguity of some of the details, like how you don't really know what exactly Julian is involved in, or what Paco is signing (or at least I couldn't really figure it out) and why he's compelled to do so. At some points Paco was almost too much of a trope, but then his wife Manilo has a change of heart and you finally see Paco as a person rather than a character. I wasn't completely sure how it was all going to be resolved - though I was pretty certain someone had to die - and I thought for sure the sheep would be killed or taken away from Anselmo. The scenes of Anselmo being a shepherd and living his life were beautiful, and honestly I could probably have watched an entire movie with just that. Funny, and very on point about various aspects of being part of a first-gen Asian family (or I guess zero-gen? The next one would be the first generation, I think?). I'm really glad I went to this one! Wow. True events can be stranger than fiction, for sure! How did no one ever get patted down for listening devices?? I loved the movie and the dynamic between the actors. I literally did a little celebration with the Landers scene at the end! Was not expecting the live footage of the Charlottesville car attack at the end, but the way they ended it by giving Ron & Patrice a look through the window into the "future" (i.e. the present) is great, because it's not just a problem of the past. An article on Lithub about the movie. I... almost didn't finish the movie. To be honest, I was very distracted and couldn't keep focused on what was happening. It could've been shorter? But it's already kind of a short movie at 90 minutes. Or maybe just have more going on? Reading the back of the case, it reminded me a lot of Shawshank Redemption. I enjoyed watching the movie, and it was kind of inspiring to see the lengths Papillon went to in order to get himself out of his wrongful imprisonment. Such a lovely little volume filled with gentle advice - came into my life at a good time. Onto You are Here by Thich Nhat Hanh next. I really enjoyed the illustrations interspersed throughout as well. Can we take a moment to appreciate this beauty? it doesn't taste as good. Interesting concept, doing the entire movie through screens, as though the viewer were following along with the investigation (and/or creeping about with a hidden camera inside the Kim residence). I don't know enough about film history to know whether this is novel or not, but I appreciated how the way the story was presented matched so well with the story itself. Yay for trans representation written by a trans author featuring a trans model on the cover!!!! That one scene with the llama. How did he survive getting shot? Or did they just let him go? I don't know if this was a magical odyssey... it was interesting, and I feel like there are messages I'm not getting because I'm not aware of the social and political environment of Chile (or... Iran? The director is Iranian.) Obviously there's the disappearing of people, but it seems like it's more than just a straightforward critique of that (and how little bureaucrats do to help prevent these disappearings or to help their loved ones find them again), and the whales beaching plays an interesting parallel to the story. I actually just forgot about NYR being a thing this year. And honestly this new year didn't seem to bring with it a new zest for life or renewed energy levels, so nah. I didn't realize this was the second part to a previous movie, though that makes sense and would probably ground the characters a bit more. That being said, I watched it as a standalone and it stands alone just fine. A fun movie, and you start getting the feeling things are more complex and interconnected than they first appear. Keep watching through the credits! This was such a good movie! I had it spoiled to me before I watched it, unfortunately, but it was still so well done. It's something you could probably watch over again if you never knew, just to see how it all makes sense & pick up on the foreshadowing. I want this to be required reading for everyone everywhere. So much of this resonated with me and I identified with a number of passages in this book - I was bookmarking so many pages throughout as I read it - and I think the fact that it did and that I did serves as further evidence that fatphobia affects everyone, whether you are "fat" or "not fat". What a subversion of the genre! I don't think I can write too much without giving away spoilers, but this was a pretty twisted film with lots of surprise turns along the way. I love this! It's such a quiet slice-of-life (in a very literal and clear way, in that we're literally getting this one slice, this one night, of their lives) that's romantic in the connection these two strangers find with one another, even in their disagreements. Again, I love this so much. Both of them remind me a lot of Call Me By Your Name, in the way that they handle the portrayal of romance in each of the films. I also just love the concept of having a movie that comes 9 years after the original... that also finds its characters 9 years after the original meeting. This one had me in tears and I do not regret a moment of it. I enjoyed the movie as a whole, but I don't think I would've watched the second one if I had seen this one first. The second movie grabbed my attention more since it actually involved the guardians involved in the case and explored their past, though this one was nice too. When the naked people started appearing, things started getting real trippy. Short chapters that were to the point, told with a wry humour. It was, as one Goodreads comment has it, immensely readable, but I want to be careful and not equate immensely readable and approachable with immensely informative. For approachability, I would definitely give this 5/5, because I honestly love the way it's written and can see it being presented as a talk (as the talk it must've been based on). I also really enjoyed the illustrations, though if I'm being picky, they split up the text at odd moments and interrupted the reading of each chapter because you'd have to stop mid-thought to read the caption on the illustrated page before returning where you left off. If you've never really read anything about dinosaurs or much about evolution, then this will be a great intro to it. And while I'm by no means an expert on either topic (or, arguably, any topic), the little reading I have done regarding molluscs and marine creeatures & history in general, our evolutionary ancestors, and birds -even if I didn't finish everything I started on that topic - made it so that I knew a lot of the stuff that was in this book. It was really interesting to read about the author & his team's discovery of the Dreadnoughtus skeleton in Patagonia, and it was also really interesting to hear about the ways that we can still look to how dinosaurs overcame certain problems in order to figure out how to build machines to overcome similar problems in our lives, but apart from that, much of it was a review for me. An enjoyable review! I would still recommend this book for anyone interested in dinosaurs or even just the natural world as a whole (so... everyone?). Why am I being so hesitant in giving it a full thumbs up, then? I guess because the last chapter didn't convince me. I get it, and I fully agree that we should do what we can to save the environment, don't get me wrong, but what the extinction of the dinosaurs & the proliferation of us mammals teaches me as far as environmental lessons go, is that even if our species dies off, something else will probably take its place. Something we wouldn't expect to succeed in the new environment we've created by being the asteroid. And who knows? Perhaps that animal will be even more successful than humans have ever been and ever will. The day after I finished this book, happened upon this Quanta article: How Nearby Stellar Explosions Could Have Killed Off Large Animals, which discusses how subatomic particles called muons could have increased genetic mutation (with more mutation among the larger animals), causing them to go extinct as a result of the mutations. It's interesting, for sure, especially if supernova explosions do coincide well with mass extinctions throughout history (it links to a paper that I will probably not actually read or research more upon). Definitely an unusual romance if ever there was one, but one that's incredibly gentle and touching and that left me drifting along a river of my own tears. Watch it. Then weep. I thought for sure this was going to be focused entirely on why it's important for women and girls to speak out and what tends to happen to women & girls who do speak out (especially the online part of it), but I was pleased to see a healthy section of the book dedicated to writing and getting good at public speaking. The self-care bit almost felt as though it was tacked on, like an afterthought, but it was still integrated well. I do think that because of the title, a self-selecting group of people will pick this up and that many of the people that perpetrate the abuses against women, especially those who speak out, who would arguably actually benefit most from reading this, simply wouldn't. That being said, Moss does a great job of giving women & girls what she purports to give them - a guidelines for why and how to speak out, what to expect, and how to take care of yourself - and I enjoyed this overall. I've never watched the original movie, but I was pretty hooked onto this miniseries! There were things that bothered me, but overall, given that I had the time to watch it in two days, I don't think it was time ill-spent. Surprisingly short & concise! I loved reading through it, and I would love to listen to the TED talk at a later date. The running commentary and dialogue through the use of commas could get a bit confusing sometimes, but I suppose that's also the point, in a way. Is this rambling style of prose common for a Portuguese novel? It's very similar to Gabriel García Márquez' writing in a way, in the magical realism. It's a different sort, but there's also this odd sort of almost horror that's happening here in The Double - an eeriness, I guess, until it all culminates in the meeting and the reality of the situation - but it's a bit different, almost a psychological slice-of-life? It's a bit hard to categorize, and I enjoy that. The wryly humorous tone works pretty well for this, but now I want to learn more about serial killing women throughout history from a more serious standpoint (and have a comparison point with serial killing men). Unfortunately, Telfer tells us that even when there is a serious study of female serial murderers, they're still not taken quite as seriously, as though the very fact of their being women makes them less harmless, less murderers? I can't help but wonder whether or not Pascal only went along with it because he was willing to love and accept her wholeheartedly and leave the past behind them to start a new life, or if he actually was the murderer all along and he's actually admitting his guilt. This was... I feel like fun is the wrong word for it, but it was delightful and the drawn-out timing of the scenes was an interesting approach. The last act, I just knew the baby was going to be born when they killed off the guy, and it's like they're bringing the baby into a world where women are more empowered and making the space safer for the baby. It reminded me somewhat of No Longer Human by Osamu Dazai, except less depressing and tortured. I expected something a bit more lighthearted, which it still was, but the person who recommended it to me made no mention of the protagonist feeling herself that she is missing something distinctly human that allows her to blend into society. Piggybacking onto the hygge hype, this book had some little gems in it and was overall a fun and colourful flip-through (with the exception of certain background colour choices that were dark enough to make the black text hard to read, physically). I wouldn't really recommend it to anyone. It served its purpose. And now I'm done with it. Another of the TED books series, I found this one more enlightening and useful than the others so far. I've bookmarked a few pages, so I'll come back with a more detailed review later. I'm about 2 pages in and this is already way more than I expected - what with a title like How to Be Less Stupid About Race, you'd think this volume would be a light, pop read, right? WRONG! It definitely edges over into the academic side of writing, though with some more casual touches than you might normally see in academia generally. I'm not even done the introduction yet, let alone delving into the chapters, so I can't say this is true of the rest of the essays, but I'm enjoying it so far. So adorable, I love it! Nice slice of life. I feel like this hasn't really picked up yet, but it should be interesting once it does? I do enjoy the pared down palette a lot! It's moving through an arc right now and I really want it to come back to Xo, but I also have high hopes that it will all come together for the best as it's going right now. I can't wait for the second season!! Listen. I really like corvids. Which leaves this 1 project that I made 100% for me: this Sebright Bantam dress, which was inspired by the silver Sebright Bantam chickens I saw at Center Island way back in the summer. 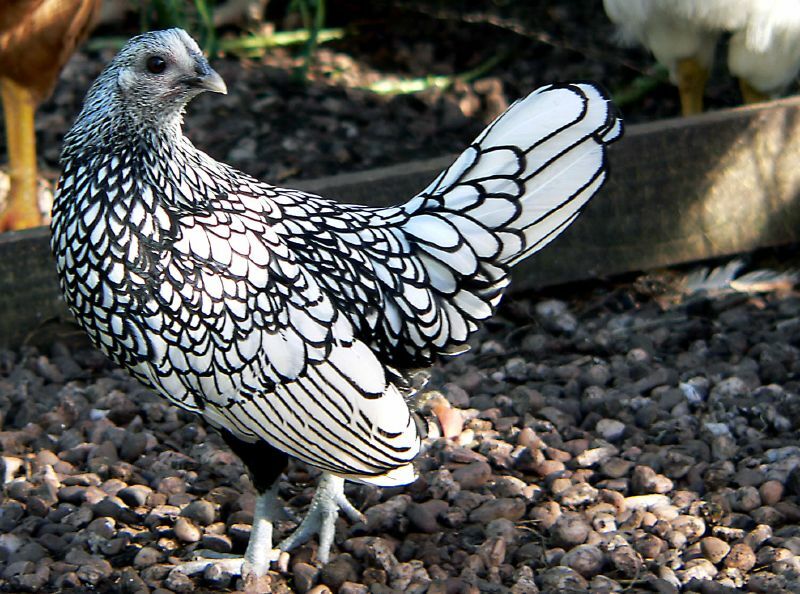 Here's a photo of a silver Sebright hen from Wikimedia Commons (attribution in caption), because I failed to take a picture of the ones on the island. Taken by Mark Robinson from Wikimedia Commons under the Creative Commons Attribution 2.0 Generic license. No changes made to the original image. Aren't they sweet? And their plumage absolutely beautiful? So I decided to make a dress that was like their feathers. It came out more mermaid-like than I had envisioned, but I like the look of the mitered diamonds, and it's my first time working with this technique, so I'd say I did a pretty good job! It's a bit tighter than I'd like. The fit is actually perfect, but because of the yarn/needle/construction combo, the smallest diamonds aren't as stretchy as they could've been if I'd kept the smallest needle size a 4mm or even just maybe 3.75mm instead of the 3.5mm I went with. Which means the dress is a bit difficult to take off - it's a tight squeeze out even if I take the both arms over the head approach. It works. It's just a touch awkward. The Einband isn't great for next to skin wear, for me. I suspect this issue would be solved if I used a slightly larger needle size for the smallest diamonds though, because then I'd be able to comfortably wear a full slip under this dress. As it is, I can wear a half slip, which is still good because the lower/larger diamonds are a bit sheer. I underestimated how many rows of diamonds I'd need for the full length of the dress so that it would be long enough for my taste, so next time, maybe also knit a full row of diamonds more for both of the two larger needle sizes so that less of the dress is at the smallest diamond level. That's basically it, though! Not too bad for a wildly experimental run where I had no idea what I was going to do for the neckline. I like the varied textures I ended up with, and I also used up some mystery mohair-like yarn I got from a stash swap - whoot! To be honest, I suppose the biggest issue right now as far as this dress goes is: where do I wear it? I've also been working on what was originally supposed to be a really lacy baby pink dress, but just ripped back most of the skirt portion because it wasn't looking how I wanted it to look, so that'll have to wait till next year to be completed. I'm not even sure I like the bodice part of it, but it's a construction I wanted to try, and I had an idea in mind for how I wanted it to be, so I'm going to roll with it and see how it turns out once I finish the new skirt. Here's to hoping I'll do more knitting in 2019! I'd really like to make some more comfortable dresses with some of my superwash merino stash (of which there is more than I'd like to admit), for soft, next-to-skin wear, so there's a mood going forward! I've also really been slacking with regards to keeping track of my reading & film-watching, so I want to get back on that. I... want to say my November list is incomplete, but it might be accurate? I also love that Arnalds posts the scores for many of his tracks on his website for free download. I don't really know what I was expecting, but it was definitely something less inane than this. I couldn't even get the fun, light-hearted romcom feels out of it because the characters and situations irked me so much! SO MUCH IS GOING ON. I want to learn more about Korean shamanism (Possessed might be a good performance to go to, in that case? And that's coming up at the Toronto Fringe Festival), but also the history of Christianity in Korea. I thought it was going to be a pretty straightforward, "oh, you went after & killed the wrong person because of your racial prejudice against Japanese people (for... obvious historical reasons) and didn't even try to consider all the factors before doing so" plot that's meant to raise the discussion of racial attitudes towards Japanese in Korea, but WHOA did this ever go beyond my expectations! It was alright. But I watched another one a few days after that also featured Hiroshi Abe and was also him in this sort of role, with a similar enough sort of non-traditional nuclear family setup situation that it made me wonder if this is a theme that's coming out of Japanese cinema right now? This was such a fun zombie movie! I don't know what I went in thinking it would be, but this was so fast-paced and exciting and just all around a fun movie! The actors slamming full force into the glass and all that was spectacular and I loved it, and that escalator scene was pure gold. I couldn't stop seeing the dad as the character from Coffee Prince though, since that's the role I associate him with since I watched that years ago. So... does the zombie deer only eat other deer, or does it also zombify humans and other animals? Not as great as I was expecting it to be considering the hype and the rave reviews about how hilarious it was that I heard from coworkers, but it was a fun movie and I'd watch a sequel. I'm hoping the huge success of this movie will spur producers & directors to create more films that have a more diverse cast! Hmmm... it was very slow. And it didn't end the way it was meant to because of budget cuts, according to the insert (when the girl would go to the South and presumably find out more about her father's past). I also neglected to read the novella the DVD came with, so that's on me. I'm so miffed I couldn't go to the talk by Hebb when he was in Toronto! I really enjoyed this book with its prompts and Hebb's experiences with people's answers throughout the death dinners he has hosted. I'd love to get one going in a community setting at the library! Lovely film. I haven't read the novel it's based on. Another Kore-eda film. Beautifully shot! And the ambiguity of where truth lies in this film was an interesting decision that reflects the judicial process pictured. This is the other family-centred film that also featured Hiroshi Abe as the down and out father. I loved the way this film places death firmly into the realm of the living, in the sense that it's going to happen and the discrimination people in the funerary industry face only serves to generate more pain in the face of loss than if we were to fully embrace the sendoff and have professionals who care about what they do, do the service for us. I didn't keep track of this too well these past few months... and apparently also forgot to change these from drafts to published posts. I don't think this October list is complete, but it'll have to do. I didn't realize the investigation into the sexism of the film industry was so incredibly recent. I know there has been increasing awareness of the challenges women in the industry face especially as of late, but I was surprised to find out how bringing everything to light in a systematic manner has basically taken place over the past couple of years. Finally! The last installment of the Incorrigibles series! It was fairly obvious Wood was going to work around the curse that way, but I still enjoyed it all quite a bit. The cover gives away a little bit of the plot, but you don't realize it until you get to it. I hope no one's surprised I'm reading this, or to find out I experienced no hesitation whatsoever putting myself on hold for this the moment I saw we had recently acquired the title. I was actually expecting a bit more information about flatulence in each of the animals rather than a cursory yes/no plus a bit of interesting information about each animal's flatulence or lack thereof, but it's a fun book nonetheless. Just not exactly what I was expecting (though I suppose expecting a more serious investigation into animal flatulence might've been a tall order). What a powerful memoir! The thread that follows Gurba through from the very beginning of the book to the very end, and the constant writing and rewriting and making sense of what happened and her ties to the murdered Sophia, made this incredibly difficult to put down until the end. There's a line in there at the very beginning, where she addresses our desire to know all of the story, and how there's this feeling that if we know everything, the story - the victim - might belong to us in a way: she doesn't. I don't know if Gurba is actually mean, because she's not that mean in this memoir, and I'm kind of confused why she chose this as the title. You kind of have to admire Altman for going to the lengths she did to figure out what's with her body. She's informative and hilarious, and I'm left wishing for more information about everything (which is great because it means reading this will inspire people to actually go out and maybe find out more about their own bodies). Talking more openly about bodies and how - I forget who said this - our bodies are such leaky vessels would do a lot to dispel misconceptions of how our bodies are supposed to work, as well as probably calm a lot of women because, surprise! there is such a wide variety of body shapes and types, and there is bodily discharge, and it's not always an issue. Also, puppy fumigation? Well, at least ancient Greek women could decide how far up to stick the straw. As someone who also has a lot of fear about a lot of things, this resonates with me a lot. WELL THIS WAS UNEXPECTED. The beginning & end narration were really weird, also - I'm kind of at a loss what exactly to get as the message of the movie. Say no to genetic modification? Except if it's already been done, then no point killing it off since it has as much right to live as anything else? I have to admit, I was pretty sad when I reached the end. Fry's dry humour (and footnotes) were a wonderful touch, and it would make a great introduction or review of the Greek myths for I want to say most ages. The only thing I had an issue with was the format of the physical paperback itself: it felt a lot chunkier than the amount of text it held for some reason. If it's going for that size, I'm not sure whether there's a hardcover version of it, but I feel like it would work better as a hardcover. Or go slightly larger and aim for a lap-sized retelling of the Greek myths. I really enjoyed reading this one! Devoured it over two days. There was a point when the number of casualties to the fuzzy mud is mentioned and I thought for sure the 5 dead would be Tamaya, Chad, Marshall, the bearded man, and maybe the vet who rescued them. I do wish Marshall's character got a bit more space on the page to develop (though he does), but for the length of the book and the format it took, it wasn't bad. Ditto with Chad. Something about the style of writing made the longer ones drag on for what seemed like an inordinately long time. The shorter stories were fine, and I enjoyed them - and I liked the longer ones at the end as well, just that I feel they could use a bit of reworking or be cut down a little shorter. That's just personal taste though. Reminds me a bit of Kelly Link's stories, in the slightly eerie and supernatural. Oh wow that imploded! I didn't expect that ending. The relations between the family members was really strange throughout, and I'm curious how the dysfunction allowed them to survive as a unit this long. A whistling language. SO. COOL. Incredible film that really makes you think about traditions & how our sense of morality, which can be so black & white, often needs to be reconsidered to allow for all the complicated nuances of reality. First of all: READ THIS. It's sad, yes. It's depressing, yes. But it's also kind of uplifting in a way, because it's right there in the open that these emotional states can overtake us without any reason, and you know what? Sometimes, we just need to roll with it, have a good cry, and then move on. This picture book (or so it's filed in our collection) starts with a bang and doesn't for a moment let you down. Second: It's the same illustrator as the Roald Dahl books! I'm wondering if this says anything about the Dahl books. Another lovely picture book that walks us through death as the child goes through the stages of grief after losing his mother. Beautifully illustrated, with astounding use of colour, everything is minimal yet all the more palpably expresses the emotions of each page for it. Anxiety reappraisal: I'm excited, not nervous. Keep telling yourself that and you'll actually perform better! This is exciting news. Not... nervous exciting, just exciting exciting. People don't think about you as much as you think they do, which... of course they don't. They're worrying about how they're being perceived, just like you are. Being nicer to yourself! Self-compassion, because you're not that special. Except, if everyone experiences what I experience to some extent, doesn't that mean I'm just not holding up as well as everyone else? Would things go well if we treated regular social interactions as improv using the "yes, and..." rule, where the "yes" doesn't mean "I agree with what you're saying" so much as "I'm listening to what you're saying, and here's what I have to add to that"? You know exactly how it's going to go down in the end, but I still love it. And I love that Jen isn't portrayed as just knowing all this stuff right from the get-go - there's still a learning curve (e.g. how she falls down the first time she shoots the gun, how she kind of winged it killing Dimi) - but is resourceful af. I mean, she still knows way more about what to do right away than I'd imagine, but it's not like she's done this before. But that final bit where Richard thinks for one hot second she'll hesitate, and THERE'S NO HESITATION. It seems a lot more a revenge on victim-blaming as a whole, considering how classic victim-blaming some of those lines were, like when Stan's saying that Jen was so into him last night, or when Richard tells her she's so beautiful they just can't resist. Here goes another foray into space and time. I didn't actually finish any of my previous attempts at physics books, so let's hope I'll be able to see this one to the end! Pretty dense, but approachable in tone. I just started reading the endnotes halfway through where I'm at right now, and they're absolutely delightful. lukprints: mostly print, other miscellanea; all art.